Learning how to make alternative fuel sources using the items you have around is an essential survival skill to learn. We are dependent on fuel sources to provide power to run our homes and businesses, help us maintain our body temperatures in extreme weather and provide energy to prepare food. Emergency organizations suggest each household having an emergency supply of fuel stored away, but there is always a chance that we haven’t stored enough. Many rely on having cords of wood to use, but those surviving in the city may not have the availability of wood to use for fuel, or they could have been caught off guard by an emergency and were not able to get to the store to purchase charcoal briquettes or propane for their grills. Learning how to make alternative fuel sources using the items you have around is an essential survival skill to learn. Biomass bricks and/or briquettes are an alternative choice to charcoal briquettes and other emergency fuel sources. They are also considered a green fuel source and burn efficiently. The biomass briquettes are comprised of compressed compounds containing various organic materials, including corn husks, coconut shells, grass clippings, dried leaves, saw dust, cardboard or paper. Developing countries use other materials such as rice husks, bagasse, ground nut shells, municipal solid waste, agricultural waste, or anything that contains a high nitrogen content. Biomass fuel sources are equivalent to that of common fuel sources when burned in an oxygen-rich environment comparable to unmodified wood and wood pellet stoves, fireplaces, patio heaters and charcoal grills. This alternative fuel source could easily be used for rocket stoves, collapsible stoves and small grills. Essentially, you get your materials and cut them up into small bits or you could use a blender and add them to a large container (a 5 gallon bucket is perfect) and allow it to soak in water for three days until it’s completely saturated and broken down and have the consistency of mush. Then you form the briquettes by compacting them in a tube or container and forcing all of the water out. Compaction is the key to achieving a successful briquette. The reason being is because compacted materials burn more efficiently. They shape of the brick or briquette can also make a difference. Studies have shown that when biomass briquettes molded into a hollow-core cylindrical form exhibited energy output comparable to that of traditional fuels. There is a special lever that many use to compact the briquettes; however, some people have successfully made them from old cd or dvd cases and by poking holes in the side for the water to drain out. In the video below, he used a caulk gun. Start thinking outside of the box in respect to preparedness. In emergency situations, we must modify our thoughts and adapt to the change itself. Chances are, if we are successful in this, we will find a way to survive. Great info and research, Tess! Thanks for sharing. My next DiY preparedness project! I’ve actually made a good supply of larger biomass briquettes using 3″ diameter PVC pipe that’s readily available at your local hardware store. Similar to the video, I’ve separated each briquette with use of a plastic wafer (spacer) and produced consistently sized briquettes. I believe they burn better if they are made with a hollow center (doughnut hole). 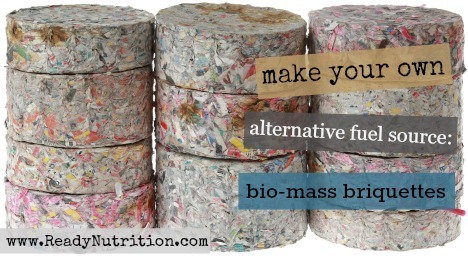 For biomass, I’ve used a combination of shredded paper stock (discards), sawdust and some charcoal. I you want to use them as “fire starters”, dip the dried briquettes in paraffin wax. I take them on camping trips and use them to light wood burning campfires. They work great. Biomass briquettes are best substitute to coal and other fossil fuels and completely replaced them. Bio waste materials can be recycle through briquette machine without using any binder and turn into useful biomass briquettes. These briquettes are used in various industries as well as domestic sector.